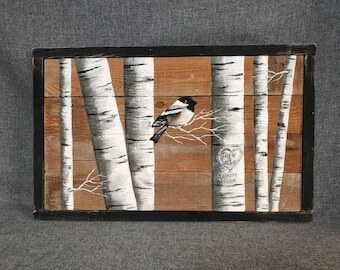 This is a picture of the original painting on reclaimed pallet wood. 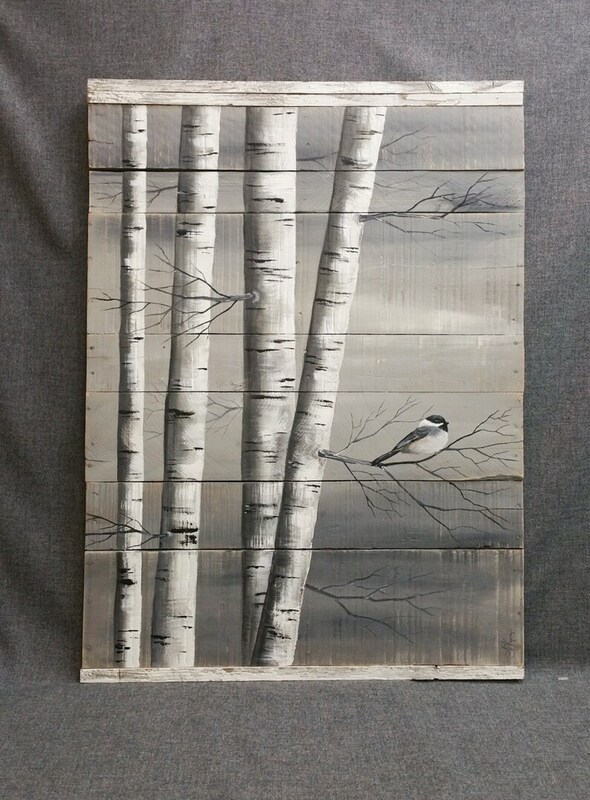 This unique, large piece is made of reclaimed pallet wood, painted a medium grey, and slightly aged. 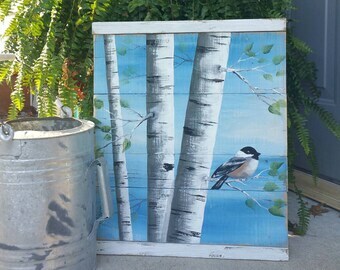 Using acrylic paints, I hand painted the birch trunks, and a chickadee. 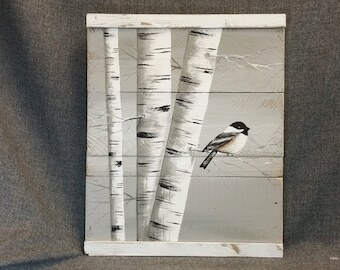 The top and bottom is accented with a strips of aged, white painted barn wood. 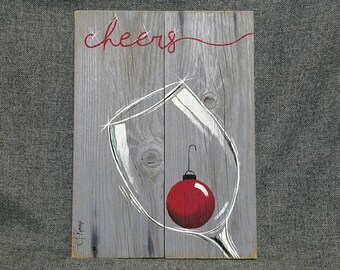 All of my creations are made of reclaimed boards. 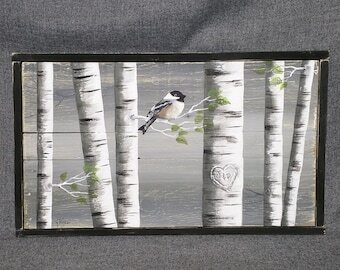 They are hand painted and are made after they are ordered. Although I try to duplicate original as closely as possible, there may be slight variations because no two boards are identical. Creations may vary in size by 1/2" to 1" either way. Painted and shipped in 10-14 days. **Any Shipping costs will refunded after shipped. Please contact me with any questions or inquiries for custom orders of different colored backgrounds. I love this painting- it’s my second! Beautiful artwork ,great price and very fast shipping- and packaged very well. Thanks! I am in awe of this beautiful painting! I bought this over two months ago to go above my soaking tub in my new bathroom, but because the room was under construction, I couldn't take a picture of it in its new home until today when we mounted it. The wall is still not done (I will try to update this review with a new picture when it is finished) but you can still see how beautiful it looks and how perfectly the painting fits. It is truly the focal point of our new bathroom! I really love the two personal touches that Jodi added for me ... they took an already incredible painting over the top. Absolutely perfect!! Thank you so much! She does beautiful work ! It is so eye-catching! Very rustic! So beautiful! I just love it! It fits so great in my rustic home! Etsy keeps your payment information secure. Sellers don't receive your credit card information. Only one coupon can be used per purchase. If you are unsatisfied with your order, please contact me and we will work to make it right. Custom and personalized orders are not eligible for full refunds. Please keep in mind that my products are custom made, so there might be slight variations from the picture shown. If you are purchasing multiple items, I will refund the difference of the total shipping after I print the shipping label. I love when people give me inspiration.... So, if you would like a special painting that you have imagined, contact me and I will do my best! Only one coupon code per purchase.